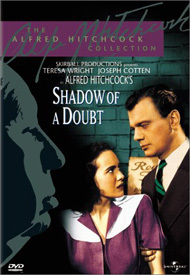 Shadow of a Doubt is Hitchcock's first 'mature' film. Sometimes criticized as a gimmickmeister, or a technically driven director more concerned with his camera and his cinematic effects than with the dramatic content of his films, the Master of Suspense here takes pains to embrace his story rather than decorate it with Hitchcock 'touches.' In Saboteur, he didn't seem to have a handle on America, but the moods and millieu of this picture capture to perfection the world of small-town USA at a certain point in history. And Teresa Wright's radiant and textured performance is possibly the best by an actress in Hitch's entire filmography. Stuck in the quiet town of Santa Rosa, the spirited Charlie Newton (Teresa Wright) alternates between grateful appreciation for her family and a desire for more excitement, perhaps even more danger, in her life. She gets exactly that with the arrival of her namesake uncle, Charlie Oakley (Joseph Cotten), a handsome and dashing travelling man of mystery who seems to have left New Jersey to elude pursuing detectives. Beloved by all, especially Young Charlie's sentimental mother Emma (Patricia Collinge), Charlie's stay is a big success until a pair of reporters (MacDonald Carey and Wallace Ford) doing a piece on 'normal American living' start snooping around the Newton family. Big Charlie does have his strange moods, and is taken to spouting disturbing opinions about the uselessness of rich widows in this 'sty' of a world. Circumstancial evidence mounts that Big Charlie might be the notorious fugitive 'Merry Widow' murderer, but even though her father (Henry Travers) and family friend Herbie (Hume Cronyn) are amateur detectives, only Young Charlie is sensitive to the signs that the family's most treasured member may be a serial killer. Everyone who thinks Blue Velvet is a great film should give Shadow of a Doubt a serious looking-over. Both are about 'normal' American towns living in seeming complacent denial, while dark and malevolent forces seeth below the surface. Both feature amateur detectives and a leading character who wants to 'know' about the reality below everyday normality, a desire which leads to traumatic disillusion. David Lynch's message seems to be that the sweet surface of life is a thin veneer that cannot totally cover a horrible underworld of vice and sickness; Thornton Wilder's thesis is that knowledge can fundamentally transform people's souls, and that the slightest brush with chaos can change the way we perceive the world. All this is conveyed in the tale of Young Charlie Newton, a perceptive girl who doesn't quite realize that she's the most mature and aware person in her warm and loving family. Adoration for Big Charlie is so complete that his sister Emma has formed an emotional life around him, much greater than her bond with her 'unromantic' husband. Part of the tension of Shadow of a Doubt is the knowledge that the uncovering of the truth about The Merry Widow killer will do irrepairable harm to the Newton family. Young Charlie's revelation of the 'noir' world beneath the visible is fundamentally different than the bad dream experienced by Frank Capra's George Bailey. Evil is no illusion. Hitchcock's actual design effects in Shadow, such as the use of a literal shadow of doom to announce the arrival of the 'devil' in Santa Rosa, are well documented. It's the naturalism of the show that impresses the most now, the everyday normality Hitchcock expresses that is not typical of his earlier work. Hitchock reportedly respected and admired Val Lewton, who seems to have had as much of an influence as writer Thornton Wilder, whose masterpiece Our Town also has a horrifying undertone. As in the successful Lewton formula, people hold down jobs, weather disappointments and endure lives that are sometimes intolerably dull. As with Thornton Wilder, characters are isolated but human, children aren't idealized, and looking for the meaning behind tragedy may make us wiser, but rarely happier. When both Charlies retreat to a bar to air their differences, the waitress Louise is a sullen young girl whose spirit seems completely defeated. Big Charlie thinks Louise proves his case when she says she'd do anything for a ring she sees on the table; Young Charlie perhaps sees herself in the sad girl. David Lynch approaches the humanity of his characters in a different way, but the feeling of Shadow of a Doubt is very much present in Jonathan Demme's Silence of the Lambs. When Clarice Starling interviews the girlfriend of a murder victim, with her bad hair and worse self-image, there's a similar social tension that gives both films a resonance with a reality we know but rarely examine directly. Although Shadow has its slightly strained aspects (the detectives disguised as reporters), the overwhelming feeling is this tension between what the world should be, what we want it to be, and what it might become the moment we start examining it more closely. Hitchcock's most subtle and least sensational film is also one of his very best. Shadow of a Doubt is a very welcome DVD and no disappointment on any level. The movie is almost sixty years old, but is in very good shape. There are some minor fluctuations in the image density from time to time that are so minor it seems ungrateful to mention them. The extras are varied and include production drawings by Art Director Robert Boyle, who contributes a lot to Laurent Bouzereau's effective documentary. Patricia Hitchcock also relates some fun stories, and talks about the young Joseph Cotten as if she still had a crush on him. There are subtitles and alternate audio tracks in French and Spanish. Go BACK to the Savant Index of Articles.